To download the free lien waiver form in PDF format, please click Free Lien Waiver in the bottom. To download the free lien waiver form, please click Free Lien Waiver. The conditional waiver on progress payment is considered to be the safest waiver as it will release all claimants’ rights through a specific date, mentioned on the form as “Through Date”, provided all the payments are cleared by the date that is referred to. A conditional waiver and release at a progress payment form will incorporate the following details: The name of the claimant, the name of the property owner, the job area, owner and the through date in the part of the form which deals with explanatory report. The next part of the application will ask the owner to fill in the details of the financial institution such as the name of the bank at which the check was drawn, the amount the check is worth and the name of the person or organization to whom the check is payable to. In addition the next portion could ask you the details of other waivers for which you haven’t received payment yet. They ask you to fill out the through date of the waivers and the exact amount to be paid. The last section will deal with the claimant’s signature, his or her title and the date of signature. Read More. This lien waiver releases all owners rights to file a lien if they have fully been paid to date and that includes no return or stopped payment checks. 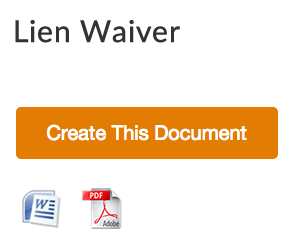 To download the free lien waiver form in PDF format, please click Lien Waiver Form in the bottom. To download the lien waiver form, please click Lien Waiver Form.